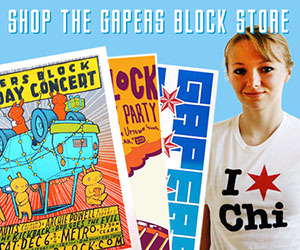 UIC Students, Faculty, Staff Demand, "Chop From the Top!" 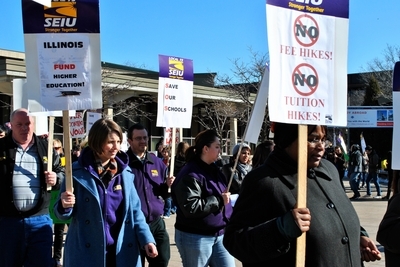 UIC Students, Faculty and Staff Rally Against Budget Cuts. 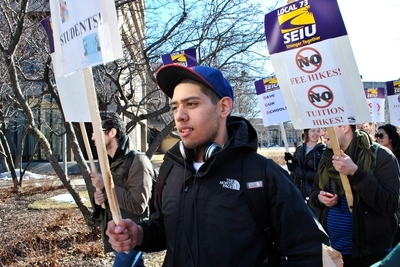 Several hundred students, faculty and staff rallied at the University of Illinois Chicago campus on March 4th, to demand an end to budget cuts that target the poor. They rallied in the Quad, before marching around campus and marching to University Hall where the administrative offices for the school are. It was part of a national day of action to defend public education. SEIU Local 73 chief Steward Joe Iosbaker led the crowd in chants, "They Say Furlough Day, We Say No Way! They Say Cut Back, We Say Fight Back!" and the sarcastic, "They Say Fee Hike, We Say, Yea, Right!" At University Hall SEIU members served Soup to passer-by's "to prepare us for what we'll be eating if the budget cuts go through." 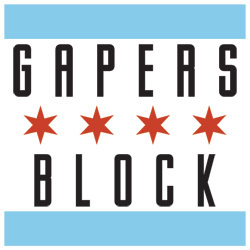 They then sang a parody of Gnarls Barkley's Crazy, "Is UIC crazy? They must be crazy,to think that they can defeat, local 73." Many UIC professors and staff are being forced to take unpaid furlough days. However their workload does not decrease. Teachers still have to grade the same amount of papers. This has led many assistants and UIC workers to work on their furlough days, essentially amounting to a pay cut. Teachers plan on taking a joint furlough day on the 8th to protest the budget cuts. Stay tuned for more details. In a forum before the rally, endorsers of the day of action spoke out about their grievances with the administration of UIC. The forum was originally intended by the activists to be a debate between organizers and administrators on the issue of cut backs, but the administration refused to attend or participate. Jes Cook from the Graduate Employee's Organization, an affiliate of the Illinois Association of Teachers that represents graduate assistants and employees spoke about GEO's current negotiations with the UIC administration. Their contract expired with the beginning of the school year on August 15, 2009, and negotiations have been slow. At stake in the negotiations is a pay raise, a guarantee of assistantships and tuition waivers, teaching and research loads, and the amount of staff support. "in the behavioral science building we had to fight to preserve our staff people." According to Cook, "it seems that whatever the deans want - happens, and that impacts people ability to continue in school." 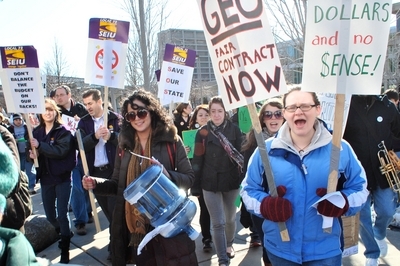 GEO members at UIC recently authorized a strike. Cook said that GEO, "would rather avoid it but we will do what we have to do to get a contract." The strike could take place after GEO's negotiations go through the mediation process. This would come on the heels of the succesful GEO strike at the University of Illinois at Urbana/Champaign, were graduate employees were on strike for one day before the administration caved to their demands. Christine Boardman, the president of Service Employees International Union local 73, which represents service staff and cafeteria workers at UIC discussed the republicans on the UIC board of trustees and how Democrats in Springfield, "lack the political will to pass what they actually need, which is a tax increase," to prevent cuts in basic services, assistance for the developmentally disabled, k-12 schools and in higher education. SEIU Local 73 will have its own strike authorization vote soon, "we are gonna have to shut this place down." Boardman explained that the right kind of work stoppage was crucial, "not everything has to be a long term strike.... to get the point across." Darold Burnum, a professor of management described faculty attempts to unionize. The UIC United Faculty is attempting to become an affiliate of both the American Association of University Professors and the the American Federation of Teachers. One of the reasons many faculty wanted a union was so that their employment would not be dependent on the whim's and good graces of their deans and managers. A standard bearer in union contracts is a grievance procedure that concludes with a decision by a neutral arbitrator. Burnum gave the example of a teacher who won UIC's Silver Circle Award, but because she was on a year to year contract, her dean told her that she was to be fired. Only after the Tribune threatened to run an article about her being fired was she offered her job back. A grievance procedure would protect teachers rights. One of the reasons why students, faculty and staff protested budget cuts, is that they were completely unnecessary. Accounting professor and AAUP treasurer Howard Bunsis wrote a report that analyzed the University of Illinois' financial condition. Bunsis spoke about the report on the day of action. Bunsis found that according to the University's own financial statements, "the university is well positioned to continue its strong financial position." Bunsis wrote his report based on the university's 2008 statements and it's projected budget for 2009 and 2010. Bunsis has come under some criticism for not using the most up to date information, however he points out that the University, despite being a public school that is legally obligated to share it's financial records, has not released it's already completed and audited 2009 statements. Bunsis explained that he had "one simple request: open the books." Bunsis explained that while the state of Illinois was with holding money for the university, the money is still going to be allocated to the university and "reneged and delayed do not mean the same thing." Bunsis said that there are alternatives to furlough days that the university never considered. He gave the example of tax company H & R Block, who are busy during tax season, but look at slow business during the rest of the year. Bunsis point out that H & R Block doesn't lay everyone off but instead borrows short term against future income. Bunsis asked the all important question, "what is going to happen when the state repays the money? Are you going to give that furlough money back [to UIC workers]?" He continued, "whats the point of making a profit off the backs of hard working people? This is not a profit making institution. This is an institution of higher education and of learning. They really should not be looking to make the greatest profit possible, that's not the goal. The goal is to educate and create citizens who can make a better society, not to build profits." Bunsis reminded the crowd that the decision to force furloughs on teachers and staff was made top down and that a teachers union is need to make sure that all voices were heard. UIC was one of many schools across the country where protests took place on March 4. Students protested the tuition hike at universities in California. High School students rallied outside Chicago's city Hall. Students at the University of Wisconsin - Milwaukee occupied their Chancellor's office and 18 were arrested after pepper spray was used on them. All of this comes on the heels of the Obama administrations endorsement of the firing of union teachers in Rhode Island. The 'turnaround' of the poorest school in the state was decided when teachers refused to accept pay cuts and to work longer hours. Many of the teachers felt that they already worked long hours and that this was an attempt to crush their union and blaming them for the real problem the school faced - the poverty of the district. Howard Bunsis commented on Obama's speech defending the firings, "he sounded like Reagan when he fired all the air traffic controllers," referring one of the key moments in modern union history, where many historians have considered it the defining moment in the decline of organized labor in the United States.